We were fortunate to have an adult volunteer in both the PM and AM classes. This brought the table groups to 6 children with one adult. What a difference this makes. I would like to make a cheer and thankyou for all those parent volunteers out there. The math program was reviewing shapes and catergorization this week. My “Sequence Vocabulary” activity happens to have shapes in it, so I decided that would be a good activity. Again I had to add 6 more sets of cards to accomodate our class size. This was a matter of printing train and shape pictures, pasting them on poster board, and laminating. In this activity the cards are drawn from a pile in the center of the table one by one. 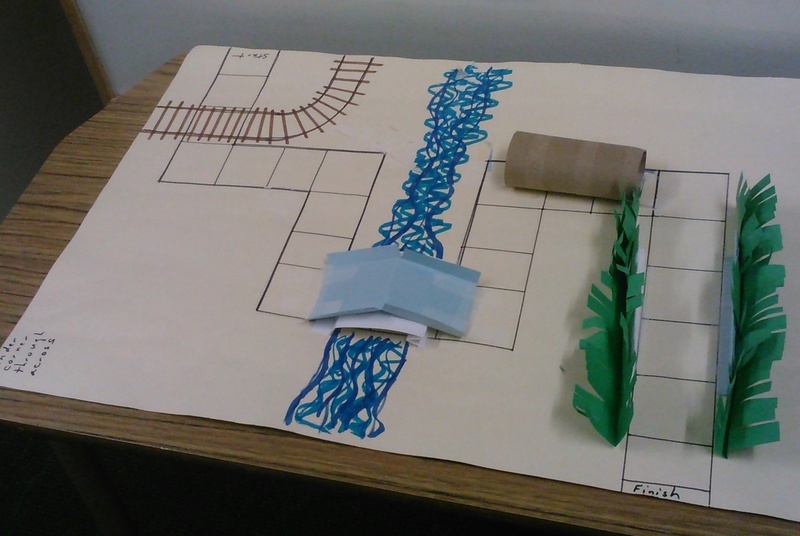 The students have a possibility of getting a shape card or one of four cars to make a train. It allows for the discussion of first, last, ending, middle, and beginning of the train. There is also a same and different decision to be made because a student doesn’t keep a card he already has. These and the shapes go into a discard pile. The first student to get the four train cards is declared the winner and the game can be played again. Six students to a table made the turn taking much easier and the game appeared to go well. We went through the stack 3 times in a 20 minute period of time. I had them each build a train sequence, review the sequence vocabulary and then rubber band each set so it would be ready for the next class. The volunteers seemed to catch on quickly. It’s good to have activities that don’t need much explanation. Today was lesson 3 of our Kindergarten Concept Groups. The Kindergarten teacher requested an activity that reinforced the concepts long and short since these were part of her math lesson for this week. We did the Question Chain Activity which is posted on the vocabulary page. It turned out to be a good choice because the counselor was taken out for an emergency and the college student had to pinch hit. That would’ve been a big problem with some of the other activities. Fortunately it’s an easy activity to pick up on. I find it amazing that some of the most simple props can be quite motivating. The kindergarten students really enjoy putting the links together and get into the competition of having the longer chain. We also pointed out the chains that were equal or the same amount. For the final concept they ‘separated” them. That is a concept that is frequently missed when we do our first BOEHM testing in the Fall. I’m a little late updating the blog this week. The activity we did in kindergarten was not one of the activities I had posted on the vocabulary page, so it held me up. It is posted as Cars and Maps now. A parent kindly donated a few boxes of match box cars. These with the ones I had were enough for 32 kids. We divided the children up into groups of 8 with one adult. We had a volunteer college student, the teacher, the assistant, a counselor and I. I unfortunately didn’t have 5 maps because I didn’t know we would have the 5th adult. Our classes weren’t as large last year so I have materials for groups of 4. So mental note; I should have enough for 5 groups because volunteers tend to show up unexpectedly. The office tends to send the college students to kindergarten. It’s a great place to start for classroom observation don’t you think? After all, all you need to know in life you learn in kindergarten. I find playing a board game tells me who is familiar with game etiquette and how to work the spinner. It’s important that each child remembers what their car looks like so you may want to do some comparison of details before you start. We of course had two cars that looked very similar. With a board game, you can start working on turn taking and not getting upset when the turn doesn’t meet your expectation. These are important skills in kindergarten. People tend to forget control and handling disappointment are skills. The spinner I use has ” missed a turn” on it. Some people would probably avoid having that on a spinner, but I think that adds the ability to practice another skill. I forwarn the children what that means so they aren’t surprised when they get it. I also have a “spin again”. The actual winning is deemphasized. It’s more important to complete the track. If time allows, I will allow each child to make it to the finish line. This is only our 2nd full week of school for kindergarten, so I was impressed with their ability to take turns. They were convinced to leave the cars on the board until their turn and handled the disappointment of the missed turn. I found everyone was not familiar with all the concepts. We have a few english learners and a few children on IEPs so that wasn’t a surprise. My other adults thought it was a good experience so session 2 was declared a success. For the speech therapist out there, I’ve added a link for pragmatic goals and objectives on the social language page. The activities I’ve been posting have been used with a language group and the students have been working on these goals and objectives.